One person loved it, but was from out of town. Another thanked me and told me it was great, but didn't really seem interested. A very nice person told me that she got more benefit from 10 minutes on my chair than from an hour in a spa massage, and asked about my schedule. The last person immediately booked a full session with me after 10 minutes on the chair. She also told me that she's a massage regular, but since her current therapist is not working due to tendinitis(a common injury with massage therapists) she has been looking for a new one. One definite and one probable new client. An hour well spent. Out on the balcony, I installed some anti-squirrel measures yesterday. The critters like to run along the overhead beams, tear up the Morning Glory I'm training to grow there, and drop onto my other plants for a bit of mayhem. The solution was to put a tight strand of wire a couple of inches above a couple of the beams. The wire is too thin for them to walk on, and doesn't leave enough room for them step onto the beam. They can find a new path that keeps them away from my plants. I'm currently reading a book on gardening titled "Flowers and Herbs of Early America." A couple of things impress me(besides how much more magnificent the plants look than mine.) One is how wide and well established the knowledge of plants was during the colonial period, and even centuries before. People knew so much more about plants and how to use them than in what aisle the bags of salad greens are found. Seeds were traded from frontiers around the world, and new books were added to an existing set going back to Classical Civilization. People(me at least) vaguely know that indigenous and ancient peoples had tremendous knowledge of Nature, but this book helps remind us that the wisdom is not just remote or abstract, but part of our heritage that only in the last couple of generations has been uncommon. Fortunately there is a bit of a renaissance in gardening today. Lets hope it thrives. Today is Bike to Work Day! Biking is great for your health, the environment, and the community. However an element of awareness is needed to maintain a happy back while riding. Except for very upright styles of bicycles, most bikes tend to put the you in the same rounded back, bent neck, reaching forward, folded at the waist position as our office chairs and cars, except worse. The upper back is over stretched, the neck is seriously over loaded, and the whole front of the body is kept contracted. I was not surprised to find many online articles on the problems caused by poor bicycle posture. They seem to have good advice on the correct way to sit, but have the same limitation as many articles on office ergonomics. That limitation is describing only about the "right" way to sit without telling you no position is healthful if held for long periods. Here is a funny Victorian era article from the medical journal _London_Lancet_ about bad bicycle posture. "...the evil consequences of this unwholesome posture in wheeling..."
My advice is simple- sit up occasionally in the saddle, stretch backward a bit, and grasp your hands behind you. The stretch is the first one described on my self care webpage. Ten or twenty seconds sitting up a couple times an hour will not cause you to lose the Tour de France. Besides that, work on unrounding your back so you ride with a neutral, not forward bent, spine. Happy riding, and see you on the road! Music isn't at the top of the list of important elements of a great massage, but it certainly adds to the experience. Since any music I have tends to get played frequently, and since it takes only seconds to pick a cd or playlist for each session, I do make an effort to provide music that will contribute to the treatment. I try to choose something that will be enjoyable, but not so interesting as to demand a client's attention. New people usually get one of my vanilla "relaxing" recordings. I have some that are(I think) not too bland but still pleasant in the background. For each massage, I try to think of what will be appropriate to this person. Then I consider if the session is more of a sports or clinical massage, or more for relaxation. Things get fun when I learn to what sorts of music a client already listens. Sometimes this motivates me to explore new music and put together a new recording. One client who is an opera lover got me searching for vocal music, and I ended up with choirs singing Bach, Handle and other sacred "classical" composers. This is a good illustration of finding something appreciated by both the client and by me. I didn't find any operas that I liked and that I thought would work for massage, but the search led me to other music that works beautifully. Another client is a jazz musician, and talking with her led me to music by Duke Ellington and Glen Miller. For these I combined several albums picking the slower pieces and removing the snappier, more exciting tracks. Two big favorites of mine for massage music are Billie Holiday and Bessie Smith. For a bit more modern sound I have some trance-y and urban groove recordings. A few things go into choosing music. I look for a lot of consistency between tracks, with transitions that aren't obvious. The tempo shouldn't change much, or the volume. The style needs to be the same. Words shouldn't be too distinguishable, or not in English. The most important rule is no "surprise" tracks that seem to be from a completely different cd. Of course I have only music that I enjoy, so no matter what I play, at least one of us likes it. This very moment, a not uncommon enough strange thing happened. There are beams across the top of my balcony that once held a roof. Squirrels use them as freeways, and in the early morning, a squirrel shadow will dash across my computer monitor. The squirrels are my nemeses, as they dig up my plants just for fun. Last week was very busy for bodywork, hence a tardy post to the blog. I'm happy to have so many people making appointments, so thank you. Although I do my work on my feet, most of us work sitting down. We also drive sitting down, eat, read, and use our computers and TV's while sitting. So when we go to the gym, does it make sense to exercise while sitting? My simplest suggestion for exercise is to not sit down during your workout. First this means your body is out of the sitting posture it's in so much and which is not natural for our alignment. When sitting our hip flexors and hamstrings are shortened. All the muscles which should be working to maintain balance are idle, and circulation is restricted. There are other disadvantages, but you get the idea. 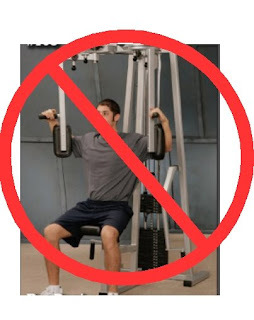 The other reason I give the "don't sit down" advice is because almost all of the sit-down machines are designed to isolate a single muscle group. If you're a professional bodybuilder trying to meet some arbitrary ideal of proportions, or care only about a few particular muscles and not overall fitness, fine. But sports and life don't involve sitting down with out backs, butts, and feet braced while pushing or pulling a rigid mechanism constrained to move in a single direction. Simply by avoiding sitting, you will avoid these nearly useless machines. At the gym you can stand, lean, swing, roll, or jump. In sports and life, when we need strength, we aren't sitting down. We're moving, picking things up, pushing, pulling, often all at the same time. Think of putting a child in a car. The entire body gets involved, working and coordinating muscles from hand to foot and at varying angles and directions. I think you'll find whole body exercises to be a lot more fun besides. Do consider working with a personal trainer at first to teach correct form, since there won't be a machine holding you in place. Yesterday I went to the garden store and bought a basil and a parsley start. I love walking through all the plants there, and I deliberately take only a few dollars so I won't buy far more than my balcony can accommodate. In a few days I'll get another basil for sure though, and maybe a marigold to eat as well.